I spoke to Gennis at Small Press Expo last fall, shortly after The Nib, which had hosted several of her comics, shut down. 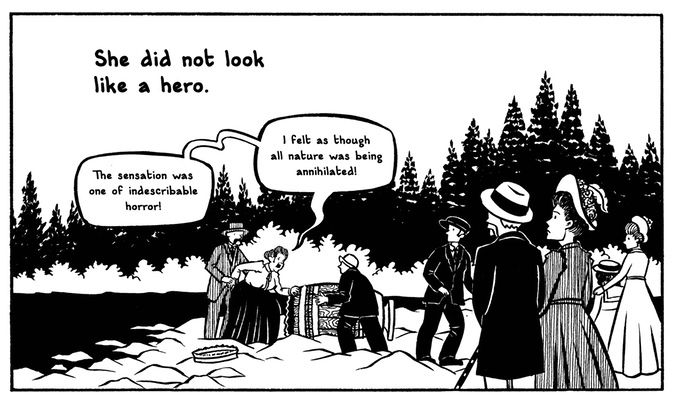 Since then, editor Matt Bors has opened up a new version of The Nib, which is well worth checking out. 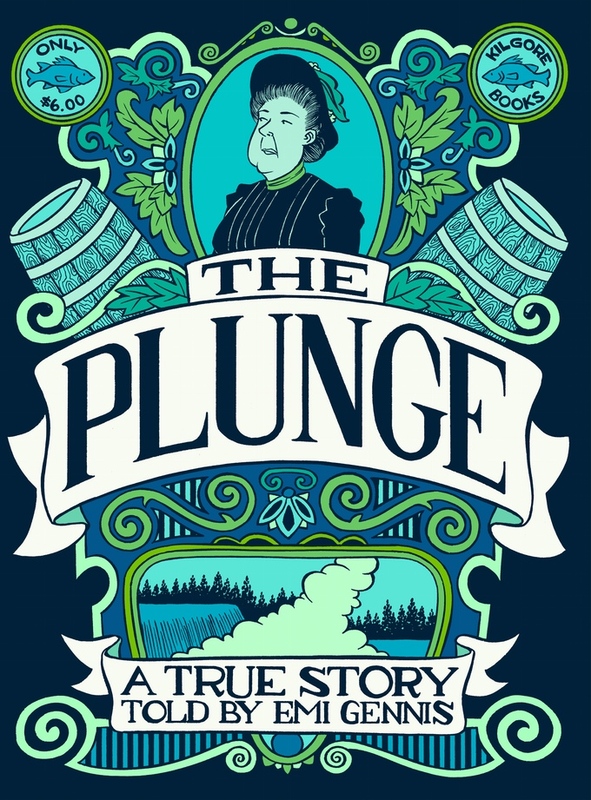 Most recently, Gennis is one of four artists whose work is featured in the Kilgore Comics Kickstarter; as it is already funded, we can look forward to the publication of her new comic The Plunge, the story of Annie Edson Taylor, who went over Niagara Falls in a barrel and lived to tell the tale. The Kickstarter is still ongoing if you want to pledge and not only lock in your copy but also help Kilgore continue and expand its publishing program. Your SPX debut comic is called “Baseline Boulevard.” What’s it about, and how does it fit in with your other work? It’s an autobiographical story. It’s sort of a meditation on grief and loss, and it’s set in the Midwest, which is where I live. The rest of my work is historical and nonfiction, but it all fits under an umbrella. I deal with themes of death a lot in all my work, it’s a little bit different, but it deals with the same sort of subject matter and themes as my entire body of work. I teach at Pittsburg State University in Pittsburg, Kansas, which is a regional state university. We have an illustration and visual storytelling major, so I teach classes in comics and also illustration and concept design. I’m teaching a lettering class this year, so that’s really fun. With your teaching you have enough time to do comics as well? Yes, I get the summers. It’s busy, but I prefer being busy, honestly. The Nib has shut down. How is that affecting you? 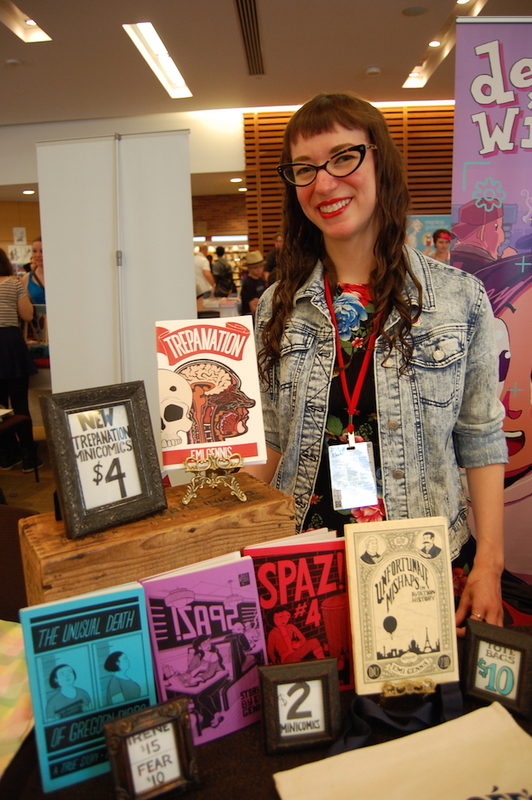 Like TCAF, SPX is quite a schlep for you. Everything is a schlep for me from southeastern Kansas! How could you not? I love SPX. I think it might be my favorite show, and I think it’s because everyone stays in the hotel and there’s more of a community feel… I’ve already seen so many old friends and made new friends. I love shows. I love this one in general because cartoonists spend so much solitary time—you’re working on this thing, and you might not have the opportunity to show it to a lot of people, and when you finally finish, you get to go out into the world and share with people. It’s rewarding, and it’s really exciting to see everybody else have that opportunity too.